If you're seeking a voyage to discover nature with a small group of like-minded enthusiasts, Lindblad Expeditions' adventure voyages will doubtless fit the bill. 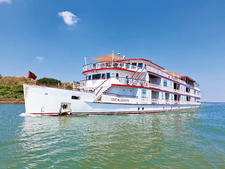 Equally satisfying are the line's cultural cruises in the Mediterranean, the Baltic, West Africa and the British Isles. 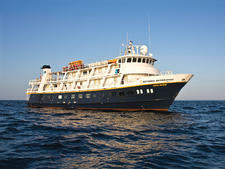 Lindblad is a name synonymous with expedition travel. In the late 1950s, Lars-Eric Lindblad pioneered soft-adventure travel by taking U.S. passengers to places rarely explored, such as Antarctica and the Galapagos. (In 2016, the line marked 50 years since his first civilian-lead expedition.) In 1979, his son, Sven-Olof Lindblad, founded a new division in his father's company that specialized in marine-focused travel expeditions. Today, the Lindblad company remains the unofficial leader in adventure voyages. Using a combination of ships it owns and ships it charters for months at a time, Lindblad offers cruises and tours to destinations all over the world. Lindblad has a well-deserved reputation for being at the top of the expedition market, and it is constantly searching for new innovations or tools to further enrich this type of travel experience. The hallmark of its trips, however, is a staff of topflight naturalists, historians, undersea specialists and expedition leaders that accompany each of its trips as guides and lecturers. Trips are carefully designed, but flexible too; itineraries depend on weather and wildlife sightings to dictate activities and schedules. On just about every itinerary, Zodiacs and kayaks permit passengers to explore nature up close, even in Antarctica and the Arctic. 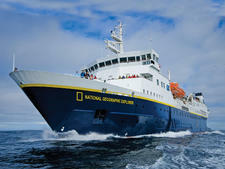 An alliance since 2004 with National Geographic allows passengers the opportunity to travel alongside the Society's renowned scientists, oceanographers and photographers. Over the years, the two entities have strengthened their partnership significantly, and now all Lindblad-owned ships include the National Geographic moniker. Photographers from the magazine accompany most sailings on National Geographic Explorer, as well as on select photography expeditions across the entire fleet. Reflecting a joint motto between Lindblad and National Geographic of "inspiring people to explore and care about the planet," the two companies have also created a joint fund to promote conservation in the areas they sail. Well before the joint partnership, Lindblad had already earned a reputation for environmentally responsible travel, and indeed, Lars-Eric Lindblad often receives credit for being one of the founders of what we now call ecotourism. There are places onboard its ships to recycle plastic, glass, paper and batteries. Lindblad supports local environmental efforts such as Oceanites or the Southeast Alaska Conservation Council, and encourages passengers to do the same; when you give $250 or more, you'll get a $250 discount (up to $500 per couple) toward your next cruise. While the company is known for offering the best academic and enrichment programs, you don't need to worry that the voyage will become dull or boring. The staff works hard to keep every day special and exciting, and most importantly, these experts ensure that everyone onboard simply has fun. Whether through swimming with sea lions in the Galapagos or sledding in Antarctica, everyone comes away having a great time. The evening recaps also provide entertaining moments and opportunities to share experiences. Through its unique approach, Lindblad Expeditions really believes its small-ship voyages are expeditions -- and not cruises. Because of the intimate size of its ships -- passenger capacities of 28 to 148 -- the ships possess the ability to get up close to wildlife with kayaks and Zodiac landing crafts. The atmosphere is casual and down to earth, with an emphasis on comfort and practicality. Service is friendly but not doting. One of the company's strengths is the numerous and superb naturalists who accompany the sailings. These experts are usually the best in the industry but are also extremely friendly and accessible. Whether on hikes ashore or over a meal onboard or at the bar at night, developing an easy rapport between passengers and naturalists doesn't take long. Cabins range from small and functional to quite roomy and well fitted out, with surprisingly luxe touches like plush towels, National Geographic World Atlases, biodegradable shampoo and wildlife photographs. Though many of the amenities and services of big ship cruising are absent (exceptions are increasing and include Explorer, Orion and Endeavour II), all ships have wireless internet access and LEXspas (offering massages, body treatments and facials). Don't expect TVs, room service or mini-bars. The line has provided its ships with nifty equipment that Jacques Cousteau would admire, including a hydrophone to eavesdrop on marine mammals, underwater cameras and video microscopes. An underwater "bow cam" on the National Geographic Sea Lion and Sea Bird and "splash cam" on ships across the fleet also record the underwater scene, and having an underwater specialist who dives and records underwater scenes every day (even in Antarctica and the Arctic) adds an entirely new dimension to your understanding of some regions. Dining is open seating, and there is a strong emphasis on using local and organic foods. The company partners with Blue Ocean Institute, Chefs Collaborative and the Marine Stewardship Council to source environmentally sustainable food. (A fleet wide policy prevents the serving and eating of shrimp onboard, for instance, due to the harmful by-catch when harvesting shrimp.) While not gourmet, meals are tasty and fresh. It's not uncommon for meals to be interrupted by an exquisite sunset or wildlife sighting. Flexibility is built into the daily itineraries to take advantage of the unexpected, and you might not know the afternoon's activity and destination until, well, the afternoon. Onboard these ships, you won't find nightlife, bingo or floor shows. Instead, on most expeditions, your days will start with an early shipwide wake-up call, and you'll spend your day climbing in and out of inflatable boats to make landings in some of the most remote places in the world, or snorkeling and diving with an abundance of marine life around you. (Some destinations are a little less intense, with expeditions to the Baltic and the British Isles, for instance, to explore the cultural side of the area that is often ignored in quick one-day port calls.) Evening entertainment takes the form of recaps, slideshows, videos and informal talks by knowledgeable naturalists. On itineraries outside the U.S., there is a ship doctor onboard; most sailings also have an onboard video chronicler, photography instructor and underwater specialist. 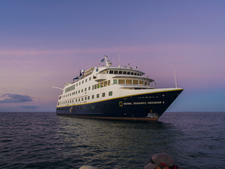 In general, passengers are well educated, committed to the environment and loyal to Lindblad. They are the ones eager to see more, do more and learn more, and they are willing to pay a substantial premium to sail with Lindblad Expeditions in order to get the best experience possible. In general, they tend to avoid larger ships, and they are all reasonably fit. (They need to be, given the climbing in and out of Zodiacs, and the lack of elevators on the ships -- National Geographic Explorer excepted.) The average age is mid 50s and up, although you'll find people in their 30s and 40s on just about every trip. Most are North Americans but there is a growing number of other nationalities. Unlike other expedition companies, Lindblad has done a good job of attracting families, even though there are no onboard childcare programs or facilities. However, naturalists may take families ashore separately, show kids how to operate a Zodiac, host a children's lunch and show them a film. Popular family destinations are expeditions to the Galapagos, Alaska, Central America and Baja California, particularly over the summer or during the Christmas/New Year period. On these journeys, there may be a significant percentage of families with well-behaved, interested children. Lindblad believes in family travel as a means of building relationships and furthering education; it's keen to point out that children are welcome on any expedition. Lindblad owns and operates a fleet of six ships, not including its first-ever new-builds: National Geographic Quest and another yet-unnamed ship that will ply the waters of the Americas beginning in 2017 and 2018. At various times of the year it also charters a diverse fleet that includes a motor sailor (a sailboat with an auxiliary engine), a riverboat, a luxury yacht and more. Lindblad achieved a major milestone with the addition of National Geographic Explorer, which used to operate for Hurtigruten (formerly Norwegian Coastal Voyages) as the 1982-built and then 1989-rebuilt Midnatsol. The vessel is ice strengthened and significantly larger than the other vessels in the fleet, but still carries fewer than 150 passengers. A complete gutting of the interiors resulted in an essentially brand-new ship with many high-tech features and equipment. In addition to the usual Lindblad toys, like a hydrophone and video microscope, the ship also sports a remote operated vehicle, or ROV, which can dive 1,000 feet below the ice. In 2014 it purchased Orion from Orion Expedition Cruises, and operates the 102-passenger ship mainly around the South Pacific and Antarctica. National Geographic Endeavour (formerly Caledonian Star) was launched in 1966 as a fishing vessel and boasts a reinforced hull for ice and heavy seas. The 96-passenger ship sails year-round in the Galapagos, and became the second ship in the fleet to be equipped with an ROV. 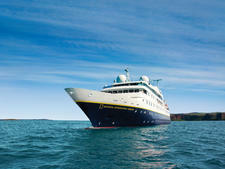 On New Year's Eve in 2015, Lindblad announced its purchase of Via Australis, an Australis ship sailing in Patagonia. The vessel has since been completely refit to the tune of $10 million and is now sailing in the Galapagos as the 96-passenger Endeavour II. Also in December 2015, Lindblad signed a contract for two new vessels -- the company's first new-builds. National Geographic Quest will be a 100-passenger ship with a shallow draft that can sail Alaska's Inside Passage in addition to the waters of Costa Rica, Panama and Belize; it will launch in the second quarter of 2017. A sister ship will arrive one year later, in early 2018, and will also feature conjoining cabins for families and itineraries in the Americas. Other ships in the fleet include the 48-passenger, twin-hulled National Geographic Islander, launched in 1995 and sister ships National Geographic Sea Lion and National Geographic Sea Bird, launched in 1981 and 1982 (respectively), each accommodating 62 passengers. Lindblad also charters the 48-passenger Lord of the Glens in Scotland, the 58-passenger sailing ship Sea Cloud in Europe and the Caribbean, the 28-passenger Delfin II on the Upper Amazon, the 48-passenger Jahan in Vietnam and Cambodia, and the 44-passenger Panorama II in Cuba.